Whether you want to create an eye-catching banner for a party, some nature inspired place cards for your table, or you just want to relax while enjoying the art of lettering, this is your go-to guide. With a growing legion of hand-lettering fans on Instagram and her Skillshare classes, Peggy Dean is a rising star in the lettering world. As a follow-up to her successful book, The Ultimate Brush Lettering Guide, Dean is going back to nature in this woodland-themed book packed full of projects, lettering tutorials, drawing how-tos, and a wealth of practice pages. Lettering in the Whimsical Woodlands provides plenty of space to practice basic and intermediate strokes, with the goal of creating your personal lettering style. Once you've mastered lettering, Dean shows you how to draw a variety of woodland creatures, including chipmunks, birds, bunnies, and foxes, as well as flowers, leaves, acorns, mushrooms, and other flourishes. By combining your lettering with line drawings, you can create stunning works of art, including home décor, invitations, gift tags, and unique holiday tablescapes. For those in need of inspiration, Dean provides a bevy of fun and creative do-it-yourself ideas. This book will provide you with an elevated lettering experience and many hours of practical, clever projects. It's the joy of lettering meets DIY fun! One of my favorite places in the world is the Pacific Northwest. For me, there's no better way to unwind than to spend time in nature—the spongy moss under my feet, the swaying of the pine trees, the sounds of birds chirping. With this book I am excited to combine my two loves—my love of the outdoors with my love of lettering. This book is meant to guide you through many ways you can expand your lettering skill set, along with how to draw basic illustrations to add visual interest to your pieces. You will learn about different tools and materials, and you will discover what works best for you based on both your personal preferences and proven techniques. Throughout the book you'll be prompted to get dirty! By that, I mean you'll have plenty of hands-on practice. The first step to mastering lettering and illustration is to put your pen to paper. I've included three alphabet samplers, along with comprehensive practice sheets. Three alphabet varieties are presented, so you can choose the perfect mood or vibe to express your intended design. Whether you are just beginning to explore lettering or you are a seasoned veteran, I hope your journey through this book is an inspiring one. While lettering is fun on its own, it's even more rewarding when we can use our love of lettering to make lasting keepsakes for our home or to share with others. Enjoy the creative process. Cheers to your lettering success! There is a lot to know about these new best friends. It's important to understand the differences as you learn how to use them, when to use them, and how to care for them. With so many to choose from, it's easy to become overwhelmed. I recommend grabbing about three so you can experiment with different brands, flexibility, and ink. After you play around with them, you'll most definitely have a good idea of the style and tip you prefer. The two main aspects of brush pens are the size of the brush and the flexibility of the tip. The size will determine how small or large you can draw. Although you can use larger brushes for smaller lettering and smaller brushes for larger lettering, a larger pen will most likely overlap on itself and distort your words, and a smaller pen often loses the effect of adding weight to a letter or design. ©2017 Peggy Dean. All rights reserved. 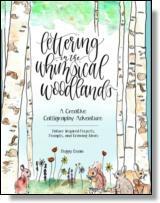 Reprinted from Lettering in the Whimsical Woodlands: A Creative Calligraphy Adventure. No part of this publication may be reproduced, stored in a retrieval system or transmitted in any form or by any means, without the written permission of the publisher. Publisher: Health Communications, Inc., 3201 SW 15th Street, Deerfield Beach, FL 33442. Peggy is native to the Pacific Northwest and is a nationally recognized freelance artist, with worldwide publications as a platform artist. Her specialties include hand lettering and modern calligraphy, line drawing, watercolor illustrations and graphic design, while her skills range vastly in the world of creativity.